Our first Masters of the Universe Classics figure of the year is usually where I start making resolutions and such to review these figures. Nope, not this year. I have no idea what I’m going to do this year. I can never review everything because I buy too much and I’m only one person. The same reused body can only have so much written about it as well, so maybe I’ll try to focus more on MOTUC this year but don’t hold your breath. Masters of the Universe Classics was supposed to “end” last year. At least that was the big pitch we got going into the 2015 subscription drive. Really, the plan was never to end the the toy line, but instead complete all of the vintage figures so that Classics would have a bookend. The line is obviously still going now with two separate bi-monthly subscriptions: Collector’s Choice and Classics 2.0. Classics 2.0 is basically a Filmation styled subscription that will do updates of a-list characters like He-Man, Skeletor, and the like. Collector’s Choice is what Lord Masque is part of. It’s an extension of the Classics line that includes some of the more obscure, fan-favorite figures that end up on all of those online wish lists. Both of these subscriptions have had their entire lineups revealed, and if you want to see Mattel’s plan for this year check out our checklist. I seriously contemplated dropping MOTUC at the end of 2015. I loved Masters of the Universe action figures as a kid, but the Classics line is so comprehensive at this point I have no idea who anyone is any more. Mattel did make it a little easier for me to decide commit to another year, however. They dropped the price per figure from $26 to $24. It’s not a huge difference like the Classics 2.0 drop to $20, but it helps. They also made the subscription as a whole a little less pricey by reducing the commitment quantity. There are still a good amount of figures, but less of the expensive two-packs that tend to hit at the end of the year. So here I am, subscribing to all of the Masters of the Universe Classics subscriptions for 2016. And I’m possibly getting into that Thundercats club later this year as well. For the most part there really isn’t much a difference between the old Classics and the new ones. The packaging is designed the same, but they no longer include a bio (or at least Lord Masque doesn’t). Nothing of value was probably lost here if they are indeed scrapped for good. The only other way to identify that this is part of the Collector’s Choice line is by a little burst on the right hand side of the package. So how is Lord Masque the figure? He’s pretty much the definition of a Masters of the Universe Classics reuse character. The base body is all stuff we’ve seen before. He has new leather straps wrapped around his upper body as well as a cape and new head. Since he uses the basic He-Man body this is as good a time as any to air my grievances with its current state. At some point Mattel decided to stop using the rocker joints in the ankles, and this is one of my biggest problems with the current base body. It’s a lot more egregious with the females, but it definitely annoys me with the males as well. When every character has the same base body it would be nice if they added a little more versatility to their ability to pose. The other issue is that they have developed hands on a swing and swivel starting with New Adventures He-Man. I don’t understand why this wouldn’t become the standard going forward? Well I do, they want to save money. But 90% of Masters of the Universe characters use swords. Having that extra wrist articulation is fantastic for sword-centric posing, so it’s a shame it didn’t become a feature of the MOTUC body. Despite being a fairly basic character his paint job and color scheme is actually really nice! They also did the cape and hood the right way by sculpting the hood into the head and making the cape a separate piece. This gives him the ability to move his neck and also avoids having the hood look too chunky, which often times happens when the hood is a separate part from the head. For a plastic cape it’s actually pretty decent as well. The thing doesn’t break his center of gravity, so he has no problem standing. Masque comes packed with two accessories: a shield and sword. Both are cast in translucent green plastic and then painted over with silver. 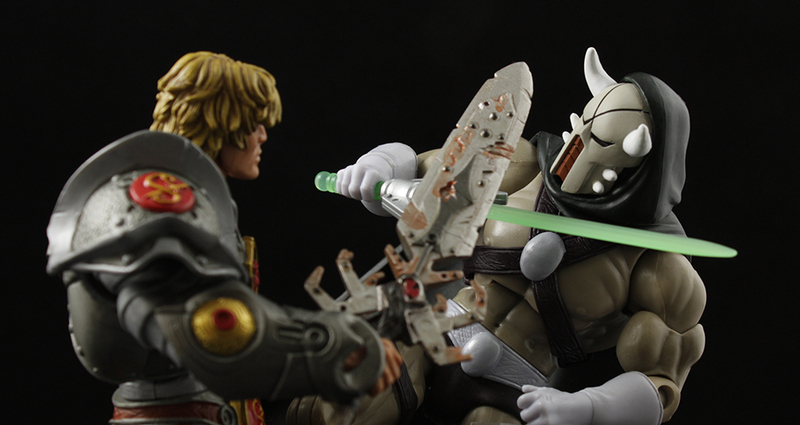 As is the case with most MOTUC weapons, the sword has “China” written on the blade. If anybody has any idea why Mattel does this I would love to know? It’s often times written on very noticeable areas of the weapons. I’d almost understand if they said something like “Mattel” or “(C) 2016,” that would make sense. The weapons are fine, though.